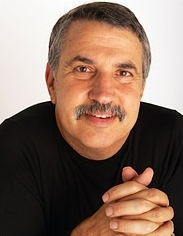 Thomas Friedman. [Source: Fred R. Conrad / New York Times]The media watchdog organization Fairness and Accuracy in Reporting (FAIR) holds up one of the New York Times’s most prominent foreign affairs columnist, Thomas Friedman, as an example of a highly respected political pundit echoing the Bush administration’s predictions of success in Iraq past the point of all credibility. Friedman’s mantra: Iraq will be settled in a few months, so Americans must be patient and let it happen. At least fourteen times over three years, Friedman has made essentially the same prediction. FAIR notes, “A review of Friedman’s punditry reveals a long series of similar do-or-die dates that never seem to get any closer.” [Fairness and Accuracy in Reporting, 5/16/2006; Unger, 2007, pp. 315, 401-402] In January 2007, the Huffington Post will note the popularity of the phrase “Friedman Unit,” or “FU,” originally coined by left-wing blogger Duncan Black, referring to Friedman’s seemingly endless predictions referring to a six-month period being required to determine the outcome of the war. [Huffington Post, 1/2/2007] Friedman’s predictions include appearances on NBC, CBS, PBS, the Oprah Winfrey Show, and numerous mentions within his own columns (see November 30, 2003, June 3, 2004, October 3, 2004, November 28, 2004, September 25, 2005, September 28, 2005, December 18, 2005, December 20, 2005, December 21, 2005, January 23, 2006, January 31, 2006, March 2, 2006, April 23, 2006, and May 11, 2006). He will attempt to explain the logic behind his predictions shortly after FAIR publishes its analysis (see June 11, 2006). He will abandon his position shortly thereafter (see August 4, 2006).